Hey, I've been experimenting again! Thought this might be useful for knife scales too, so check it out and let me know what you think. You may be able to take some fairly bland wood and give it a whole new look. testing, documenting and sharing like this is awesome. I agree with BossDog, good video and good info. Thanks. Really cool. Thank you! I wonder if you sanded some of that off and repeated a few times with something like curly maple if it would make that figure pop. Yeah, I'm wondering the same. I plan on trying it on some more woods eventually. 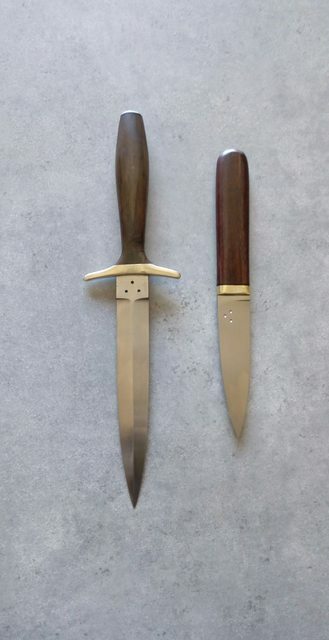 I have been getting quite good darkening of some of my handles by using the buffing whee that has been used on brass with white compound.I did a sgian dubh with jarah and a dagger with walnut today and they are dramatically darker than the raw wood. Not the best pic but will get better ones when I post them on the main forum.